These tiny people are brother and sister, two children of a family of five born in the village of Tanlagan, Province of Capiz, Island of Panay, P. I. The little lady, Miss Martina de la Cruz, is the second child born in that family of five, 58 years of age, height 21 inches, weight 74 pounds. Her brother, Juan, is 57 years of age, height 24 inches, weight 50 pounds. These little people have every joint, bone and muscle in their body the same as any normal person. They are very bright and intelligent, having mastered three of the dialects of the Phillipine language, namely: Tagalog, Viscayan, Pampamga, Spanish and English - practically five distinct languages. The parents were average size Filipinos, also the other three children in the family. The midget man is married to an average size Filipino woman, Gregoria Gabriel, 31 years of age. They had 3 very pretty baby girl, Maria, which was of normal size and just as tall as her papa. The baby died at the age of three years in the town of Daytonia, Florida, March 15the, 1907. 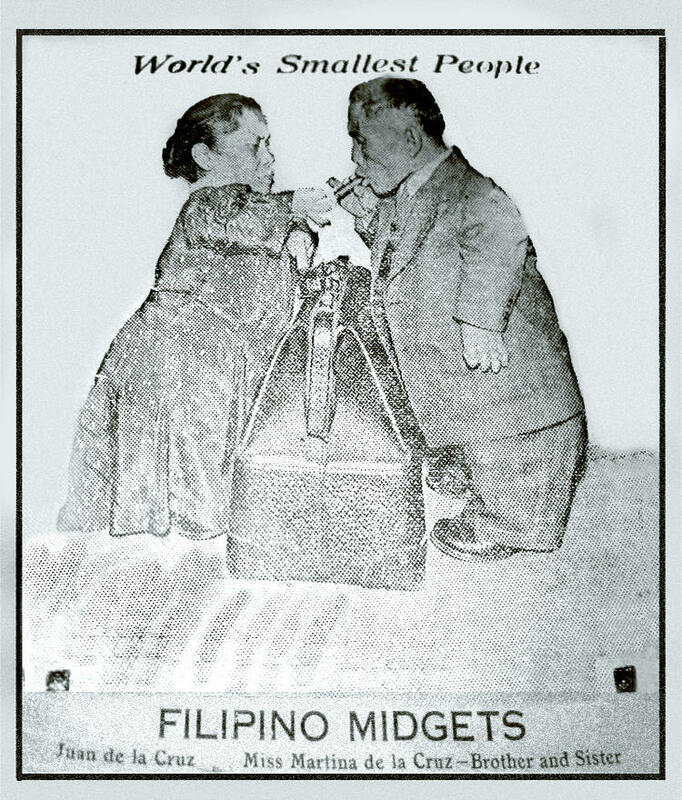 The Filipino Midgets are the smallest adults known to be alive today in the world. It is amusing to watch these tiny bits of humanity dance together, and the little man go through his acrobatic performance.